Russia's fifth richest man has denied reports that he has bought the world's most expensive home. 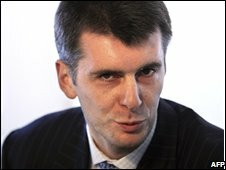 Mikhail Prokhorov, worth about $22bn, said he was not the mystery buyer of the southern France property. 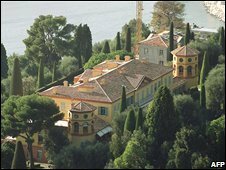 The Villa Leopolda in Villefranche-sur-Mer, on the Côte d'Azur, sold for 496m euros ($730m ;£392m). Mr Prokhorov's spokesman said the magnate refused to do business in France until he got an apology for being held in a prostitution probe. French and Russian media had insisted that a Russian billionaire had bought the property. Sources close to Chelsea owner Roman Abramovich deny that he was behind the big-ticket purchase. It wasn't me...Mr Prokhorov says he is not the buyer of the 500m euro home. Central London and the French Riviera are the current hotspots for Russian buyers, according to Jamie Hewlett of Savills. With the recent surge in commodity prices, there are still people in the market looking to purchase a very exclusive address, he added. The price tag for the Villa Leopolda smashed the previous record of £117m which Britain's richest man Lakshmi Mittal reportedly paid this year for a home on London's so-called Billionaires Boulevard close to Kensington Palace. However, Asia's richest man, industrialist Mukesh Ambani, is expected to move into a 27-storey property he has built to house his family and offices in Mumbai next year. With a value reported to be up to $2bn, the design was said to have been inspired by the Hanging Gardens of Babylon.